I went yard “sailing” yesterday with my friend. We didn’t find many, but still had a really fun day. 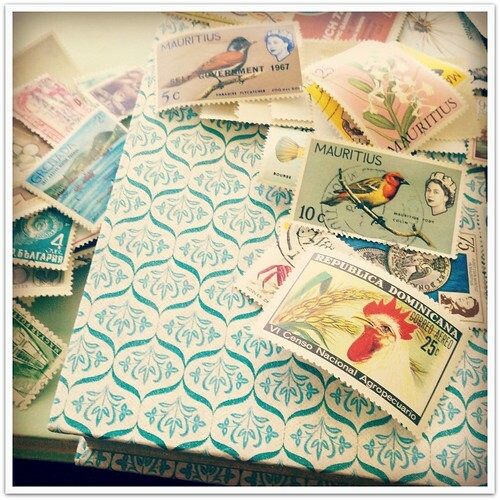 I did find a few vintage books (I could not resist that turquoise pattern cover) and some really cool stamps. $2 total! The heat factor has been creeping up way to soon. I mean, the last time I checked it was still April! It hit 100 degrees today (37.7 celcius). I am not ready for this heat AT ALL! So, to keep cool, I’ve sipping on flavored water. 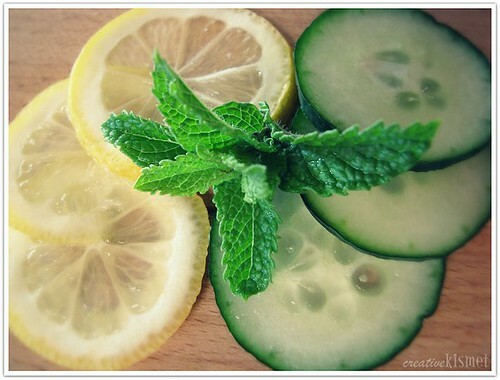 A few slices of cucumber, lemon and a few mint leaves in ice cold water. 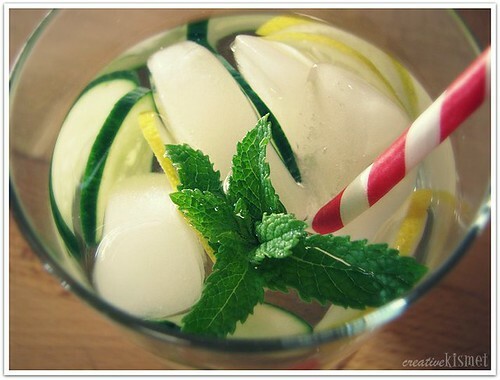 Mmmm, so refreshing. The cucumber is my favorite. Good with a few frozen berries too! And really great way to keep cool. This entry was posted in Food, recipes, Recycle,Reduce,Reuse. Bookmark the permalink. I´ll trade you with our 4-7 degrees celcius anyday!!! One of my favorite things about being in Mexico, was that I didn´t have to wear three layers of wool. I could wear normal clothes! What a delight! Here in Portland, we’re finally having some ‘spring like’ weather. I’ve got the windows open and the sun is shining and it’s only 7:30 in the morning! I’ll be sipping on some cool water soon myself! We were in Phoenix yesterday for Pat’s Run, and when we left (at 5pm!!!) it was 101 degrees. When we landed in Philly this morning, it was 51. We’re freezing! I’d be happiest somewhere in the middle. Ahh, your photos have such a lovely, “cool” look to them…we haven’t been nearly as hot as THAT but I have loved the warm days we’ve been having lately. I recently blogged about my huge haul of postage stamps from an auction; I never find that sort of cool stuff at yard sales! Congrats on your finds! 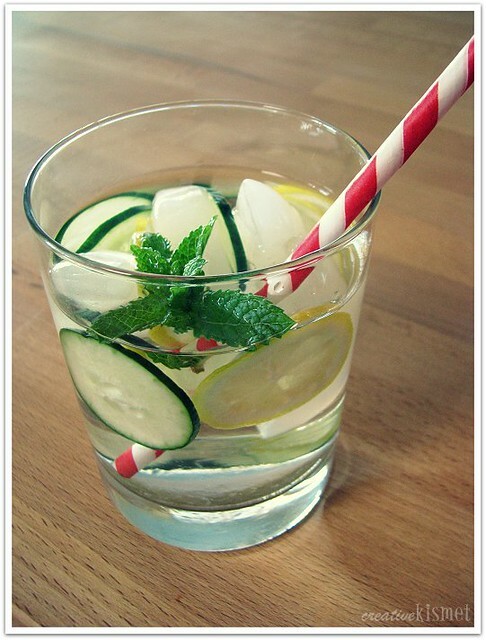 I love cucumber water. Never thought to add mint and berries though! Great idea.